The Avocent AMX5100 desktop user station adds an additional RJ45 port to connect a local computer using an AMIQ server interface module. The user station provides access from your desk to an Avocent AMX KVM switch. 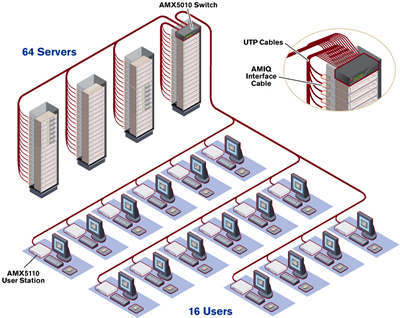 The AMX5100 connects to the user's multi-platform peripherals and sends the KVM signals over an industry standard CAT 5 cable to the AMX matrix switch. AutoTuning technology is an Avocent exclusive. The AutoTuning technology automatically compensates for varying cable types and lengths and adjusts for signal losses each time a switch is made to the server. The AMX5110 user station works with the patented OSCAR GUI. The OSCAR interface uses multi-lingual, intuitive menus for click and connect system configuration and server selection.